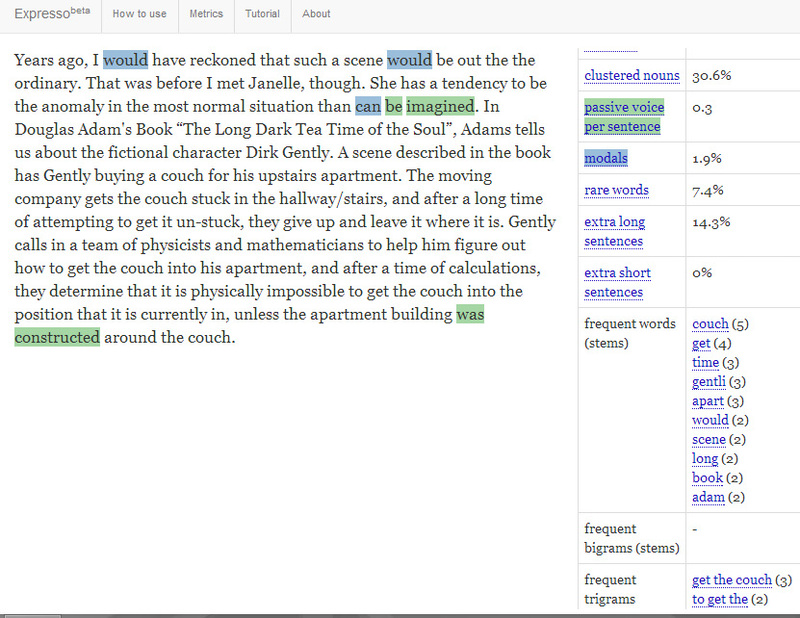 I have seen text analysis engines before, but these engines generally are used for text mining, or data mining of text. 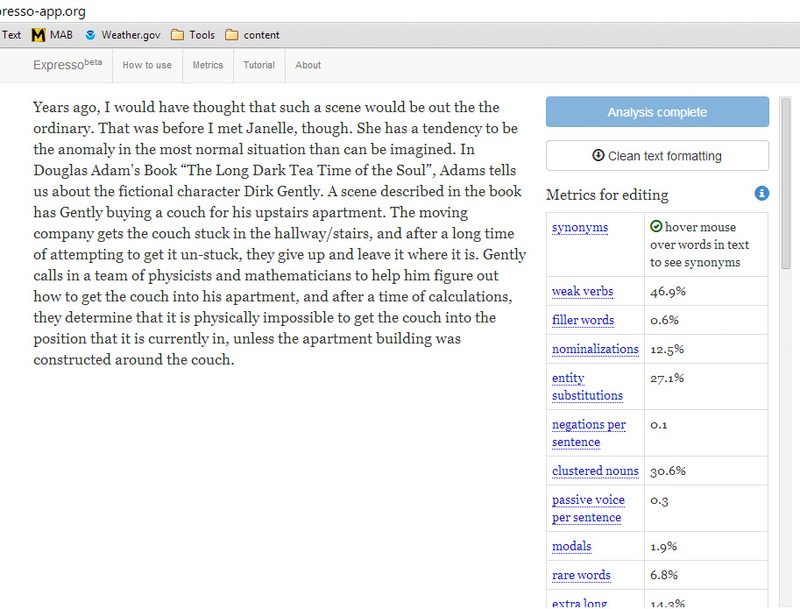 I have never seen an app that analyzed a writer’s style. Until today. I just found Expresso, and I am incredibly impressed. Before I get into the details, I need to say that this is one of the cleanest, purest, uncluttered apps that I have ever seen. It is beautiful in its simplicity. While good writing style is hard to master, there are several simple yet powerful techniques which many writing guides and coaches focus on. They can quickly improve the quality of your texts. Expresso teaches these techniques by applying them directly to your writing. I picked a random post from my blog, and copied a random paragraph from that post, and pasted it into Expresso. Now as I click on each stylistic “problem” from the metrics on the right, it highlights the related portions of my text, and I am able to determine whether or not to make a change. I can also change the text in the app and analyze it again if I want to. Writing metrics employed by Expresso can be powerful but they are not a “magic bullet”. They highly correlate with good writing but are not the cause of it, just like umbrellas correlate with rain but, of course, don’t trigger it. Therefore, there is no benefit in optimizing the metrics blindly. For example, constructing short nonsensical sentences out of several common short words — “it”, “get”, “all”, etc — will result in a low readability grade; however, the text will be unintelligible. Instead, use highlighted metrics to identify weak areas and to get ideas for possible edits. Posted on March 19, 2014 October 25, 2016 by Matthew A BennettPosted in Essays, ToolsTagged analyze, blog, style, text, tool, writing. Previous Previous post: What do you desire? Go and do THAT! Interesting. I played with it a bit. There’s a huge difference in my blog writing and my fiction writing … which is a good thing, I think. I googled the site, because I didn’t see a link to it here. Did I just miss it? The “Express does look like a nice tool to have. I’m sure it would come in handy for me. Man! I wonder what will come out next. And another thing,, I have to agree that writing is an Art from the way you figure out how and what you trying to say. For example, my last piece of writing is better because I have a better understanding on what I’m trying to do and say. By the way, my new piece is called “Super Stud.” As much as I hate to rewrite 4 stories that I’ve published already, I must, for future visitors, if I’m lucky, to my site. And lastly, I was doing chores to my sites and came across my Twitter, which I never visit, and saw you here as well as other sites. I haven’t forgot your help you gave me . . . Oh yeah! I did not realize that wordpress had that writing daily writing prompt for everyone. You exposed me to something I did not know was going on. Anyway. I think I better stop. There’s much to do. Good luck with your writing and music.